Industrial designer Marc Newson has created a limited-edition silver tea service for Danish metalware brand Georg Jensen, which features handles made from mammoth tusks. There are only 10 editions of the five-piece set available, each of which costs £82,000 and will be made to order in the company's Copenhagen workshop. 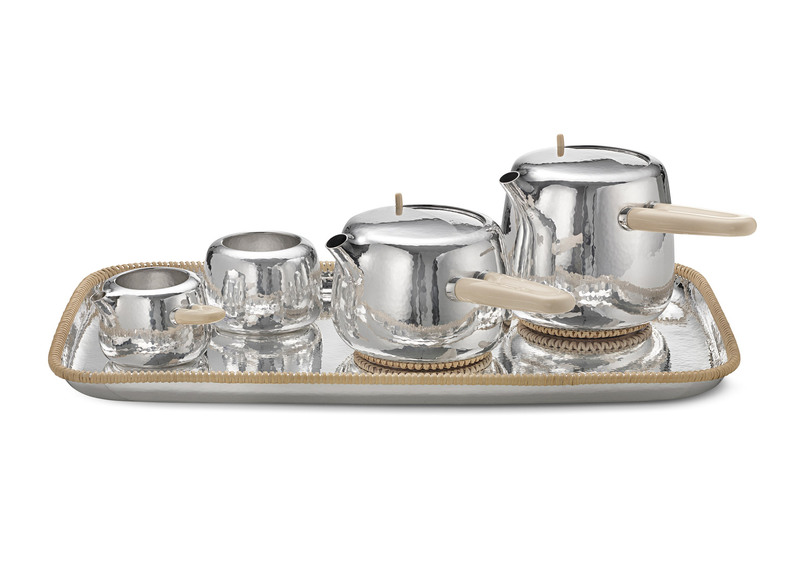 Featuring a tea pot, a coffee pot, a creamer, a sugar bowl and a tray, the set has been made from hand-hammered silver. The edge of the tray and the bases of the tea and coffee pots are wrapped in rattan, and handles that extend out from the side of the pots are made from "responsibly sourced" mammoth tusk. A half moon cutout on the top of the pots houses a sliding lid, moved by a small pill-shaped handle. This is London-based Newson's first partnership with the 111-year-old brand, and the result of a six-month-long design and engineering process that brought together craftsmanship and rapid 3D prototyping. According to a statement from the company, the very first set was hand-hammered by a third generation silversmith whose grandfather had worked alongside founder Georg Jensen. "Marc Newson was, for me, really the only choice to design a new tea service for Georg Jensen," said CEO David Chu. "Through his unparalleled, diverse experiences in industrial design, tackling such profound and elemental subjects as speed and motion, architecture, and the recording of the passage of time, and having begun his career as a sculptor, as did Georg Jensen, who else but Marc could bring to this domestic, modest and functional family of tea related objects the gravitas, the feeling of universality, the harmony of domesticity and ceremony?" Newson – who joined the Apple design team at the end of 2014 – has designed a number of luxury items from a retractable fountain pen for Hermès and a range of pens with nibs plated in rare metals for Montblanc, to a limited-edition samurai sword. Earlier this year, the Australian designer's Lockheed Lounge retained its title as the world's most expensive design object, after selling for more than £2 million at auction. Georg Jensen's previous designer collaborations have included Aldo Bakker and Scholten & Baijings. Update: This story was amended to reflect new information from Georg Jensen's press office about the price of the tea set.